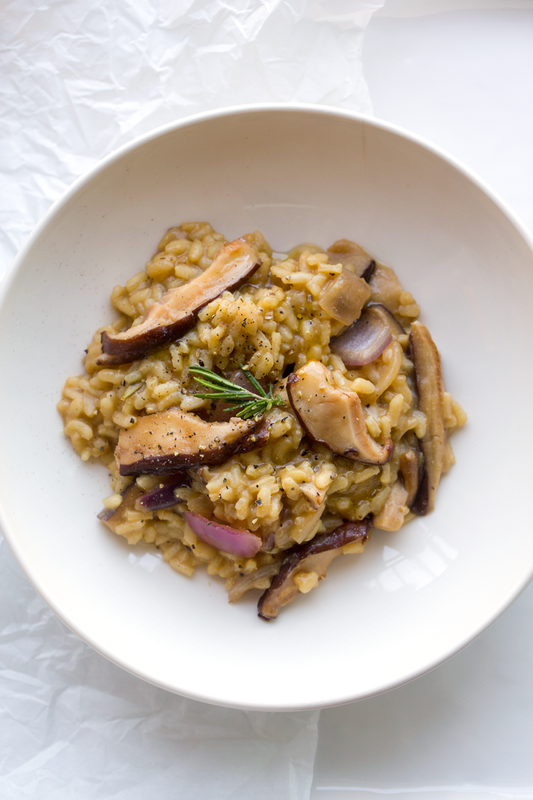 Today’s recipe is a wonderfully fragrant and fancy-feeling dish, Mushroom Risotto with rosemary. 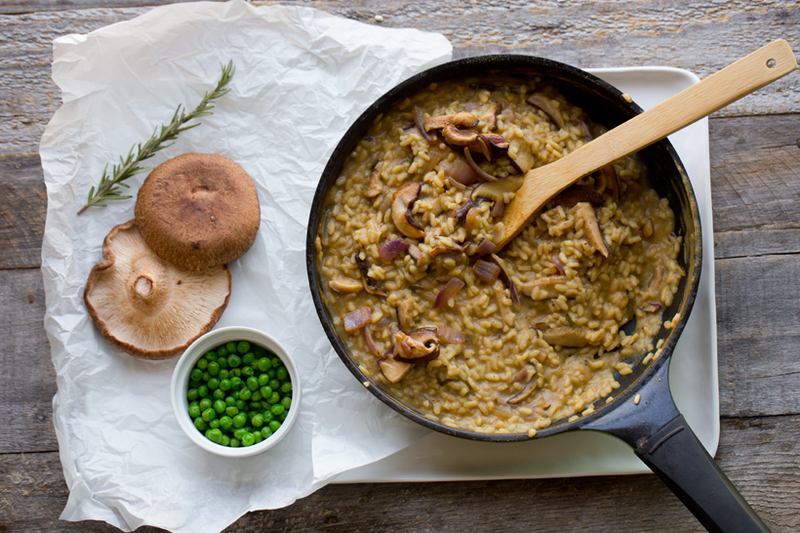 This entree is creamy and warming with a generous amount of mushrooms in each bite. 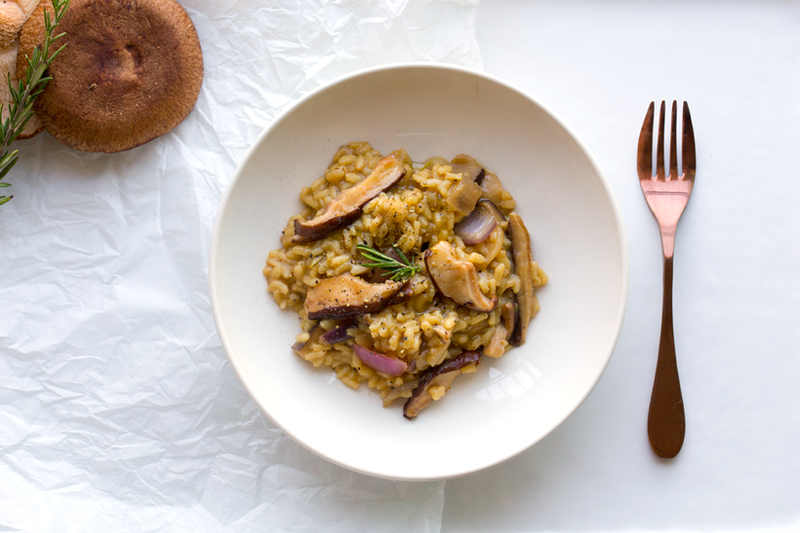 I have made this dish a few times and I loved using a variety of mushrooms, shiitake, oyster or even diced portobellos. This dish is accented with rosemary, garlic, onion and black pepper. A hint of wine or balsamic too. Protein-rich green peas make a great add-in too! One of my favorite mushroom cooking tips.. To boost the flavor of mushrooms, try a splash of wine or a splash of balsamic vinegar. You can add the splash towards the end of a sauté, after the mushrooms have browned, caramelized edges and have soaked up all the oil and flavors in the pan. The acid (via wine or vinegar) helps to deglaze the pan a bit too, to release all those pan-stuck flavors. Just be sure to turn the heat off or at the lowest heat when you add the wine or vinegar since the alcohol is flammable and will make the pan steam and sizzle. Arborio Rice. 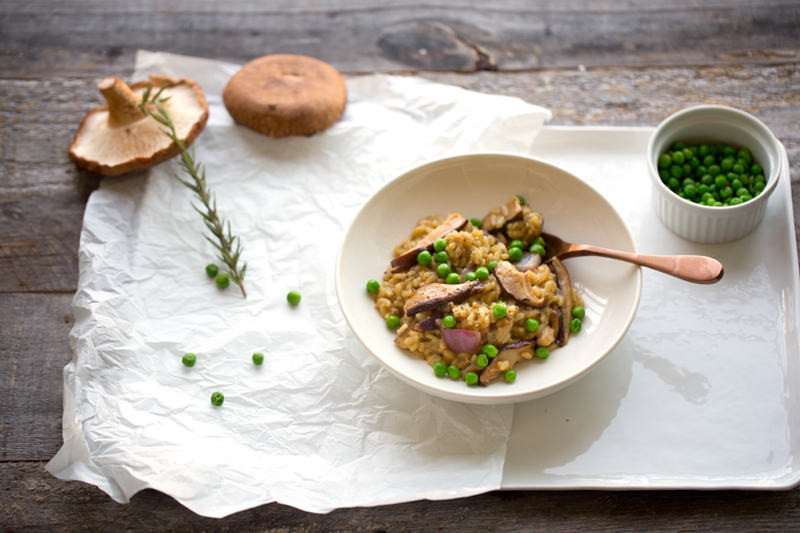 Arborio rice is a special variety of rice used to make risotto. 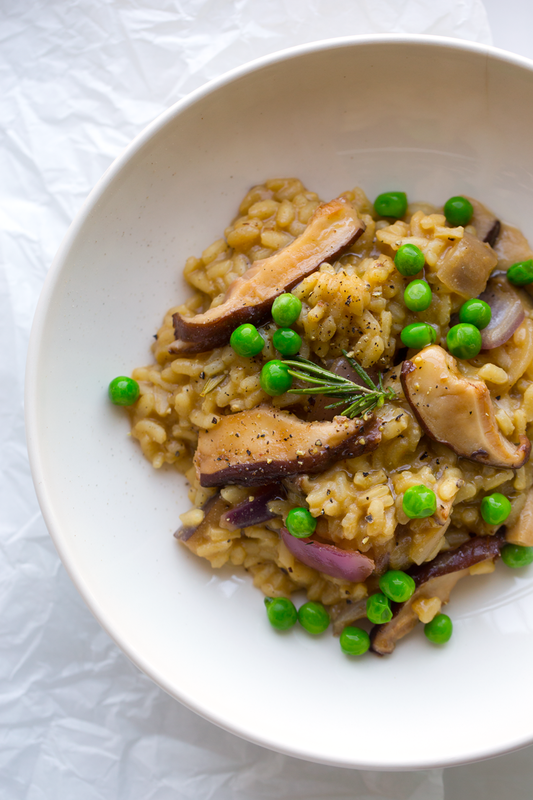 It is an Italian, short-grained rice that produces a very creamy texture when cooked. 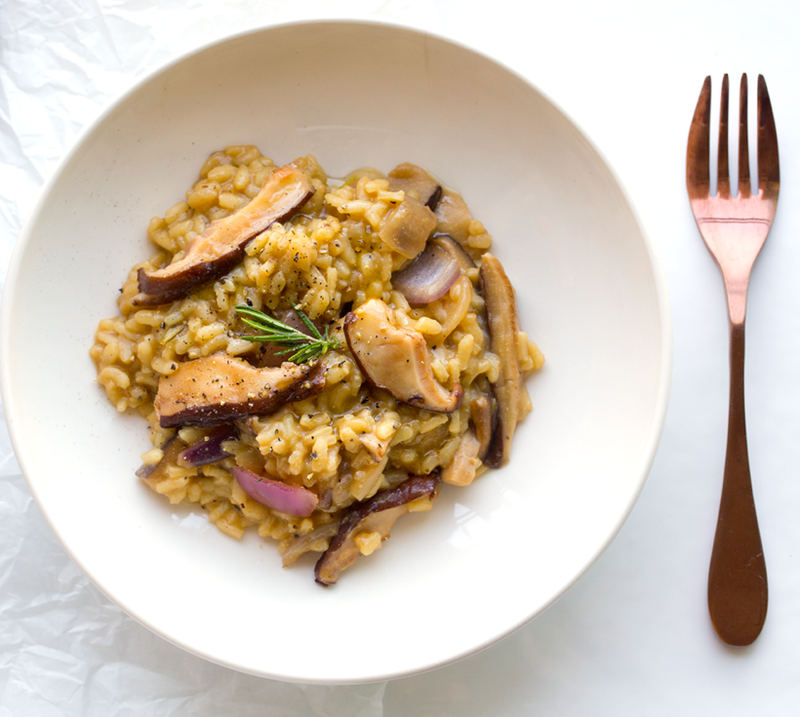 Risotto is a dish that takes some time and love at the stovetop, but the results are like no other recipe out there. 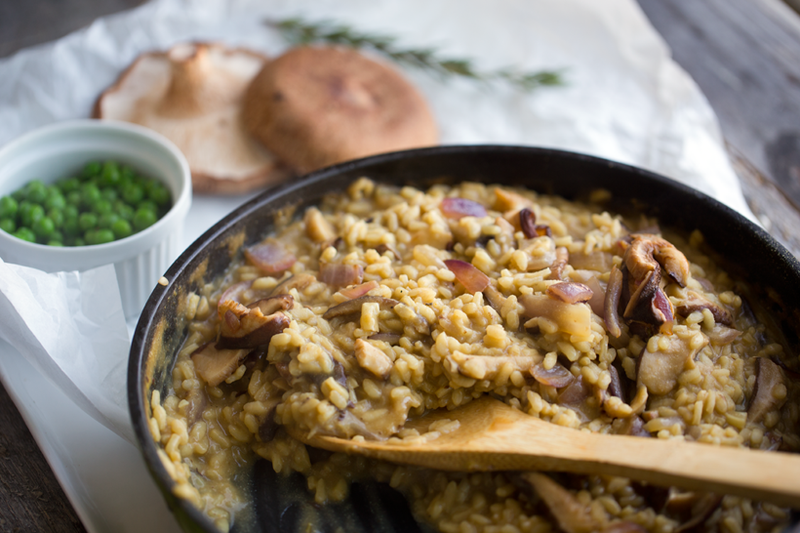 Risotto makes a lovely special occasion meal, or even just a special comfort food meal. 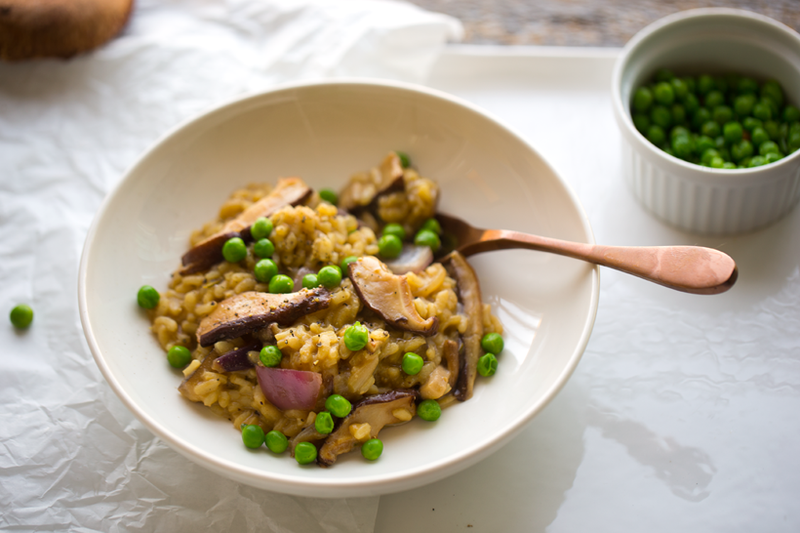 Risotto can be accented with a wide variety of veggies, spices and herbs. 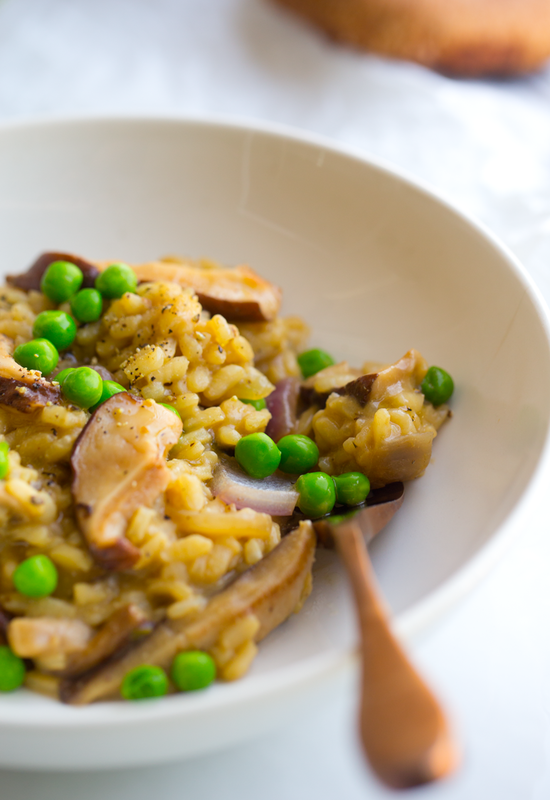 After trying today’s mushroom risotto, try butternut squash risotto, spinach risotto, lemon risotto and so many more…! 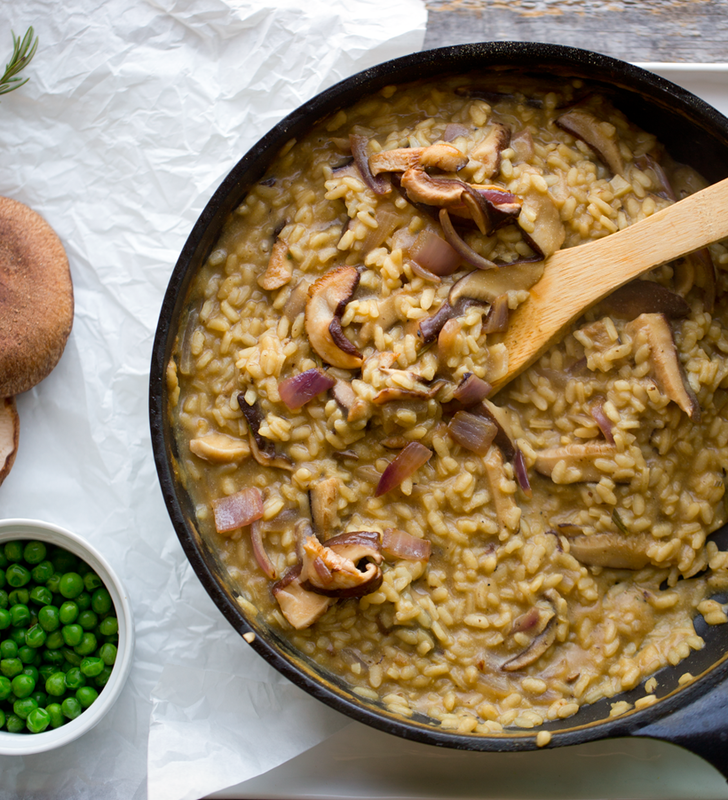 This creamy and fragrant risotto is flavorfully loaded with mushrooms, garlic, rosemary and optional peas. Warm a skillet over medium-high heat. Add the olive oil, garlic and onion. Saute for two minutes. Add the mushrooms. Saute for another 2-3 minutes, stirring every ten seconds or so. Reduce heat to low then add in an optional splash of vinegar or wine. Spoon out half of the mushroom mixture into a side bowl. Set aside. Turn heat back to medium and add in risotto and about two cups of veggie broth as well as the sprig of rosemary. Start gently stirring the risotto at a constant pace. You will keep doing this for about 25-30 minutes, until the risotto is cooked. Add in the additional liquid about one cup at a time until the liquid is absorbed or steamed off. 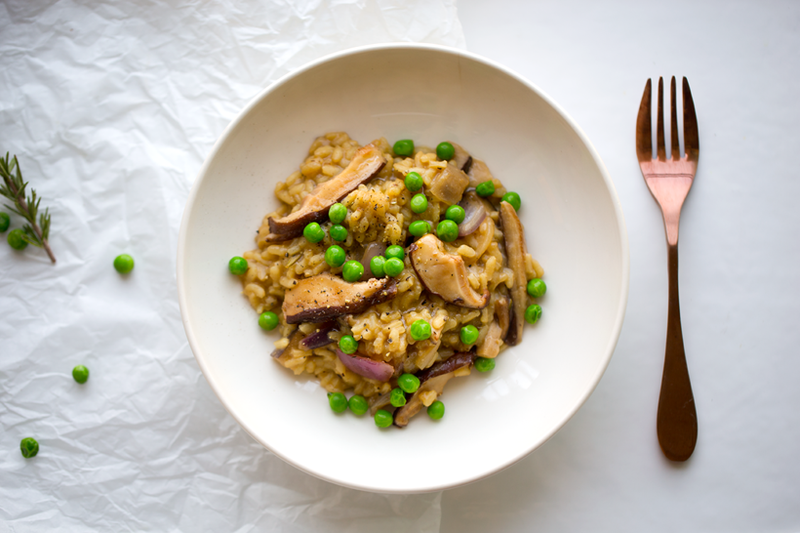 You will know the risotto is done when the rice is thick, creamy and is soft to bite through. You do not want the inside of your rice to be crispy at all. 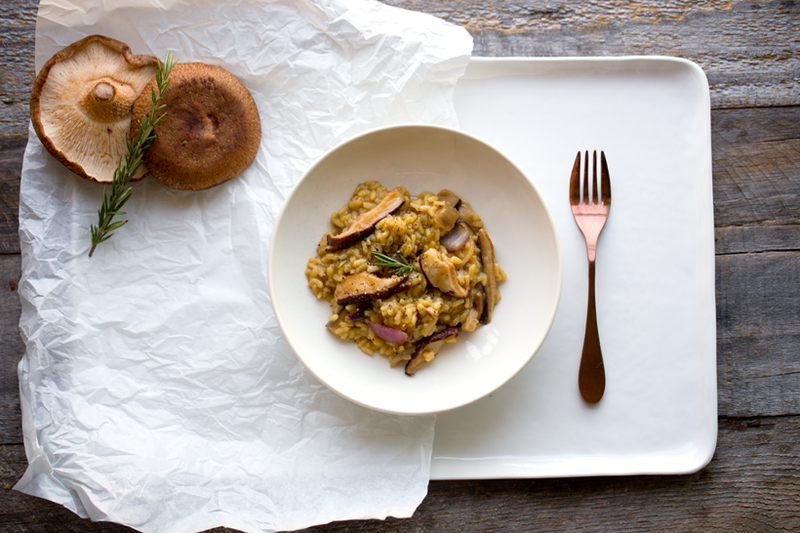 When your rice is done, fold in the additional mushrooms that you had set aside. Also fold in the nutritional yeast and optional peas. Add salt and pepper to taste. 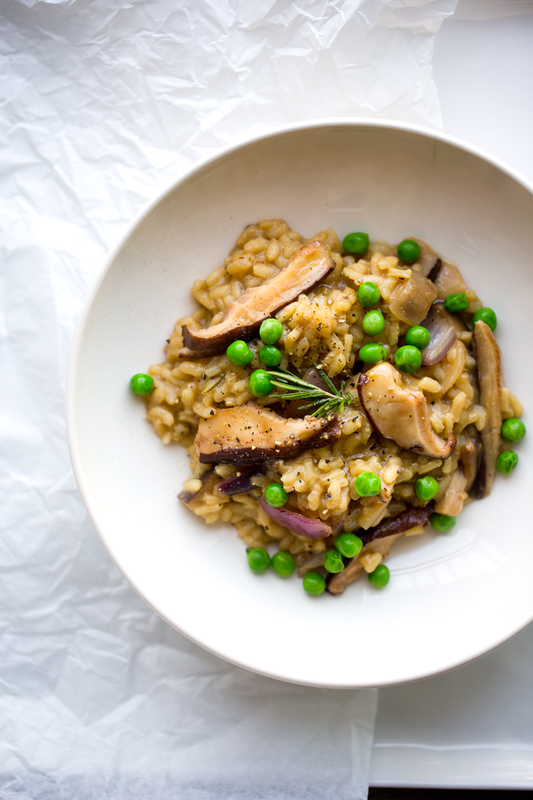 I was inspired to add the peas to this dish from this recipe in the NY Times. Such a lovely way to add protein, color, a hint of sweetness and texture.